The maximum RRSP contribution limit for the 2012 tax year is $22,970. There are other factors in calculating the limit, so read on! Remember that the RRSP contribution limit applies to the previous tax year. Your RRSP contribution limit will be 18% of the previous tax year earned income or the RRSP contribution limit ($22,970), whichever is lower, plus any unused contribution room from previous years. Earned income basically means income you earn from a job or business (including real estate rental income). Income or dividends from investments do not create RRSP contribution room. You can find out your current “contribution room” or “deduction room” on your Notice of Assessment which you should have received from the Canada Revenue Agency (CRA) after filing your taxes last year. If you don’t use up all your RRSP contribution room, it will get carried forward forever. One fact which can be confusing is that the RRSP contribution room created by earned income in any given year is applied to the following tax year. So if you made $50,000 in year 1, you can contribute $9,000 to your RRSP and claim it against your year 2 income (or any subsequent year). You can’t claim it against the year 1 income. You can contribute to an RRSP for any tax years where you turn 18 or older up to a maximum of 71 years of age. You can contribute right up to the end of the year where you turn 71. Contributions to pension will reduce your eligible RRSP room. Check this post for RRSP contribution deadline. early. Any help would be appreciated. Thanks. If you die, your RRSP will be “cashed in” and the amount will all be counted as part of your taxable income for that year. I don’t see why any unused contribution amounts couldn’t be used to help offset that income. It’s possible that the law doesn’t work that way however. I suspect a more likely problem would be: How would the executor know that you have unclaimed RRSP contributions? If they or your relatives don’t know about them – they will be lost for sure. I would shoot Jim Yih an email over at http://www.wealthwebgurus.com/ (contact link is at bottom). He is the expert with estate matters. If you don’t or can’t use the contribution room, it will just disappear. You should might want to consider planning to not put the entire amount into your RRSP if you think this is a likely occurrence. Use your TFSA as much as possible. Maybe just put a portion of the amount into the RRSP now, and then plan to put more in later. There is no perfect way to plan this, since you can’t predict the future. This is really informative Mike! Especially, the insight on the “soft” deadlines for RRSP contributions, it is very timely for this time of the year. As most people evaluate where they stand with their RRSP contributions, an RRSP savings calculator can be helpful in ensuring and/or getting them on board with their retirement savings goals. Thanks for reminding me to get on with opening my self directed RRSP account! Excellent post Mike. A great post. I wonder how much contribution rates will drop now that people are putting more money into TFSAs. a) Having started to contribute to RRSP’s (by maximizing) at the age of 42 (my age when I landed as an immigrant in Canada and started working! ), will there be any real advantage for me at the time of my retirement? Currently, it helps me in reducing my taxes. However, I feel it is very beneficial to those who contribute at a much younger age say 24 considering their span of work life. b) Is it possible to withdraw my RRSP’s at the time of retirement from any part of the world (say India) if I am then not located in Canada? Appreciate your feedback to my above e-mail address. @ Mike: Re – How would Wendy’s executor know about RRSP contributions that are unclaimed? a) on the 20?? tax return, amount $x was contributed, amount $y was deducted and amount $z is recorded as available to future years. b) last years return, $0 was contributed, amount $y was deducted and $0 available to future years. Telling the executor would be best or for those who don’t want to bring their executor up to speed, leave a note highlight any tax strategies (ex. this one or leveraged investments etc.). In theory, since the unused portion is recorded and CRA will be notified of the death, CRA should catch this. It may take while though and generate changes to the tax return. In 2010 I contributed $10 to my RSP. In 2011 during the 60 day period, I contributed another $15. All together, I’ve over contributed by $3 for tax year 2010. Can I just use the over contribution of $3 for tax year 2011 since I essentially purchased it in 2011? (RC owes me money and yes its lost interest) thanks a million and I hope you answer this during off tax season. Hi Harvey. Yes, you can wait to claim your 2011 60-day contribution. Is this possble? I would like to withdraw money from my rsp to pay bills. In this same year, I would like to contribute money to my rsp via the unused rsp contribution room I have…For example, I withdraw 100k from rsp to pay bills- withholding is 30%- ie 30k. When I complete my tax return for that same year, I am required to pay 44% of tax on the 100k of rsp money withdrawn- ie 44k. After netting the witholding tax of $30k against the tax bill of $44k, I still owe 14k in taxes. But I still have 50k of unused rsp room available for carryforward. Can I take 15k out of the 50k unused rsp room as an rsp deduction to offset the 14k in taxes owed in the same taxation year? Hi, I landed here as an immigrant in 2010, I got a job in January 2011 as a casual staff,but it became a permanent full-time job in May 2011. I started an RRSP contribution in October 2011. I just want to find out if I have not run foul of any laws. Could I use it to for any tax-purposes? I have a bunch of room left for RSP contributions from past years, but very little earned income. If I contribute more than my earned income, can the deduction be applied to other income? I just recieved a 60 day contribution slip that I wasn’t expecting and I’ve already filed my taxes. Can I hold it until next year and claim it then? I totally forgot to file my RRSP’s on my tax return this year, and didn’t need it for I still got a big refund. Can I keep all the whole amount for the following year. So that would be Jan 2011-Dec 2011? I bought rrsp this year, have never used it for tax purposes, could i get my money back. I have the same issue as above, I filed one year of taxes and didn’t have the contribution receipts and so totally forgot about entering the RRSP purchase on my Tax return. So now that I realize I had made contributions, can use the purchase on this years tax return? Thanks for any help! I didn’t know about the back-alley-working-with-an-advisor-past-the-contribution-deadline loophole. I really enjoy your website. 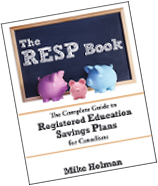 I also bought your RESP book just before our daughter was born 2.5 years ago, and her RESP is off to a good start with a small mix of TD efunds. I had a question regarding retirement savings and a potential alternative to my current “couch potato” type portfolio. I began my RRSP portfolio in 2007 when I began my career. My portfolio is quite diverse built with a 30 year time horizon so it is quite aggressive for an ETF index portfolio (Major indexes covering large and small caps around the world including emerging markets, and a few Reits, rebalanced once a year). The other 10% is in bonds, XBB, and a short term laddered corporate and government bond ETF. The management expense ratio has varied between 0.40 and 0.60% over the last 5 years. Thank you for your time… I look forward to your response if you have time! I’d be curious to know what you think.